West Coast Express commuters in Coquitlam may have found their trip a little more bear-able Thursday morning. 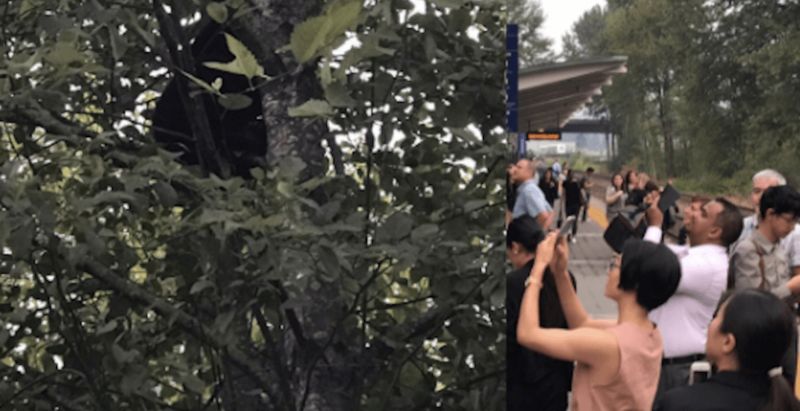 A small bear decided check out the morning rush at the West Coast Express Coquitlam Central station, where it was seen in a tree by bystanders, not far from the train platform. The sighting immediately got people talking on Twitter. Among those who caught the moment was Port Coquitlam Mayor, Greg Moore. “This morning at Coq Central West Coast Express Station a baby bear was hanging out watching people watch it,” he wrote. Just spoke w @cqrcmp re: baby bear in tree by the #Coquitlam Central WCE stn. Mama bear believed to be nearby; ppl heard rustling in bushes. While encounters between bears and humans don’t always end well, this particular encounter was not one of those times. “The bear left on its own, no issues,” a Coquitlam RCMP spokesperson told Daily Hive. Sometimes, when it comes to Mother Nature, you just have to grin and “bear” it.